I’m back with another lovely indie polish… Harmony by MDJ Creations: Such an unusual shifting topper. I spot green, brown and reddisch pink. And it has some holographic sparkle in the mix too! Shown here is one coat over black undies with top coat. You can find Melissa’s creations here. She offers (fast!) worldwide shipping. Today I have Llarowe‘s polish of the month September to show you. This reminds me that I’m so incredibly far behind with posting all the gorgeous polishes here… sorry lovelies, I’ll try my best! Take a look at Talk To The Hand: It’s probably not a surprise that I love this one since purple is one of my fave colors 🙂 This is two easy coats with top coat. Unfortunately the sun let me down the day I photographed this, so these are made in natural daylight. Nevertheless, it’s beautiful, right?! What’s your fave color if it comes to nail polish? I’ve seen many photo’s of other girls who did a ‘nail meet up’ but honestly I was pretty nervous since it was my first time meeting the girls in real life. After all we had a great time! So much fun! And of course we brought each other gifts, nail polish… what else? 😀 Nailluminati totally surprised me with a polish of which I already gave up hope ever getting my hands on… Mirrorball by Orly. AWESOME! Thanks again, D! 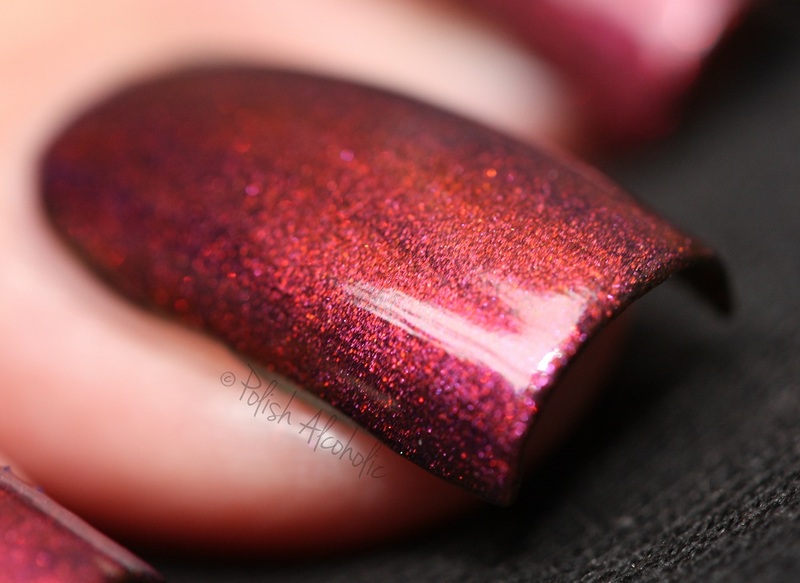 How about a juicy purple polish with pink shimmer? This is Superjuiced by I Love Nail Polish: This is such a pretty color! I applied three thin coats plus top coat here. And as with the EdM I showed you yesterday, the shimmer is more noticeable in real life than my photo’s show. I was over the moon excited when I saw that Hypnotic Polish added Emily de Molly to their awesome range of polishes. I always wanted to add some of her polishes to my collection. One of the first ones I picked up is Veiled Flame: The shimmer is more noticeable than my photo’s show. So gorgeous! The formula is great. I used three thin coats plus top coat here. You can easily get away with two more generous coats though. What do you think of this one? Have you tried Emily de Molly polishes yet? Check them out here.